Charter a private jet to Nice Côte d’Azur airport with Bespoke Air Charter and explore the cosmopolitan charms of the city of Nice, gateway to the Côte d’Azur. Nice is a vibrant, energetic city located on the south east coast of France, on the shores of the Mediterranean Sea. It is named Nice la Belle (Nice the beautiful), due to its never ending brilliance. It is home to some of the most picturesque beaches; imagine yourself gazing across the azure sea, as the light refracts brilliantly from the surface. Now envisage yourself landing in sheer elegance and style via private jet charter and on arrival at the Côte d’Azur airport you will soon be surrounded by the magnificence of Nice. 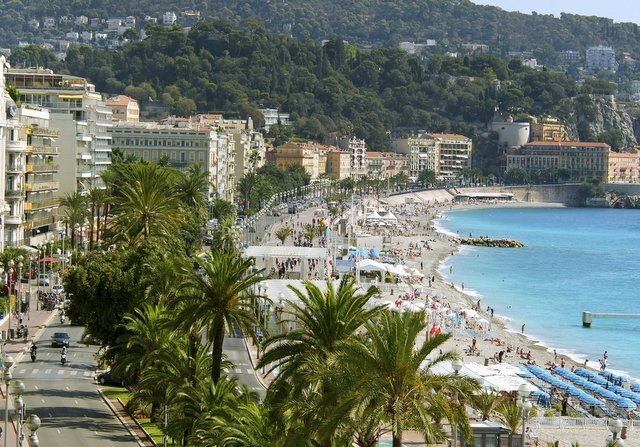 You can take a relaxing stroll along the Promenade des Anglais, as you ponder the elusive beauty that surrounds you. At almost five miles, the beach curves generously around the Bay of Angels. In Vieux Nice (the Old Town), you are can soak up some of the architectural splendour that the city offers. Although deemed a little touristy by some, Nice has always offered a welcoming, if sometimes boisterous and lively ambiance. As you follow the winding, slender labyrinth of Old Town, be sure to experience Cours Saleya, a treasure that houses the city’s famous flower market. You will be greeted by a heady floral scent, as the streets teem with fresh fruits and a bright smattering of bouquets. Whilst you take a gander down Rue Droite be sure to take a look in to Eglise de Gésu, which is slotted between the tightly packed, tall pastel buildings. If you find that this has not quite satiated your curiosity of Old Town and you still hanker for some culture, before heading to the beach to soak up the rays, your next stop is Place Rosetti. Place Rosetti is located in the “coeur de la vielle ville”, the heart of the old town; the Cathédrale Sainte-Réparate and the fountain are must-see spots. By day you can encounter the most luxurious ice creams and the traditional terraced restaurants. By night, the square becomes a magically lit hub of musical extravaganza, appreciated by tourists and youths alike. This Michelin star restaurant, Flaveur, is located au centre-ville at 25 Rue Gubernatis. Its highly authentic specialities are delicacies with an added exoticism. Specialising in affluent Mediterranean tastes, Flaveur presents the customer with an exquisite fusion of expert flavours, which will illuminate your palette. If the idea of these splendid culinary delights doesn’t grab your complete attention, then perhaps the full, rich wine list will tantalize your taste buds. Visualize the excellence of a flawlessly presented Michelin star dish harmonising with impeccable vin rouge. Nice is never-ending in what is has to offer! If, after a day of relaxing at the beach, or ambling around the many twisting lanes of Old Town, you are still longing to experience traditional Nice, may I suggest the Opéra? Opéra de Nice provides three types of performance: Opera, ballet and classical concerts. It is also home to Ballet Nice Méditerrannée and the Nice Philharmonic Orchestra. This is the perfect opportunity to experience something is enjoyed locally and seems less focused on tourism, and more on traditionalism. Nice harbours such a lively, poignant, famous atmosphere, it is not surprising to find celebrities such as Beyonce, Naomi Watts and Kate Moss enjoying the delights of the city before heading to the Cannes Film Festival, just a short drive away. Keep your camera at the ready to snap those candid photographs of the stars!